Welcome to my December 2017 monthly income report! We’re well into January now and things are flying over here at SPI headquarters. 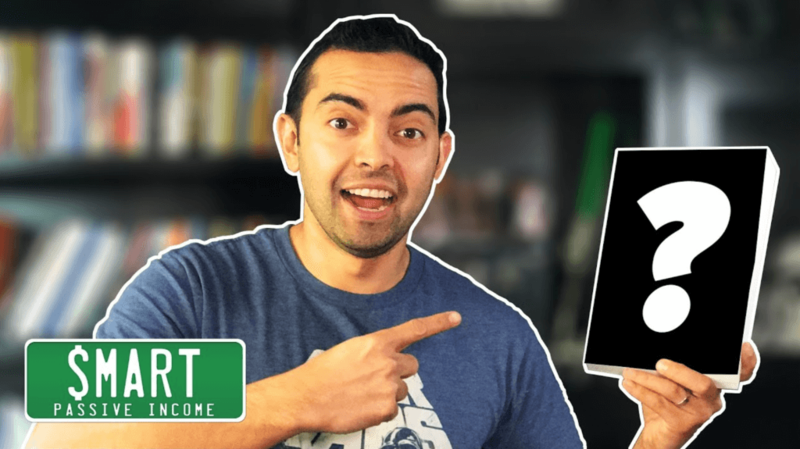 I’m working on getting ready for my YouTube push next month (subscribe here so you don’t miss anything) as well as some behind the scenes implementation of funnels for my online courses. More on that and other 2018 plans later in this report. In December I turned 35 years old, celebrated my son’s 8th birthday, and spent a lot of time reflecting on how the year went. Best of all, since the kids were home for two weeks for Christmas break, I got to spend most of my time with them and my wife, and I did very little in terms of heavy work. I’m thankful to be able to celebrate another successful year of business, and I’m stoked to cap off the 2017 year with one final monthly income report with several highlights to share and lessons to pass on. Traditionally, each December, I become a student of Michael Hyatt’s 5 Days to Your Best Year Ever online course. It’s been super helpful in aiding me to wrap my head around setting ambitious but realistic goals for the following year, and I definitely contribute a lot of my success in 2017 to my planning done in the course the previous year. To diversify my earnings and earn ~50% of my income from affiliate marketing, and ~50% from other sources, including my own products. To create at least 2 online courses to aid in goal #1. To enjoy a total of 4 weeks with the family on a vacation, unplugged. To read at least 1 book per month. To touch the rim of a regulation height basketball hoop (10 feet). I accomplished all but one of the above. I was able to enjoy four weeks of vacations with my family throughout the year, including a trip to Australia, and not only did I read at least one book per month, I was able to read a total of 45! If you’re interested in my reading habit to achieve such a number, watch this YouTube video here. If you’re interested in my top pick for business book of the year, watch this YouTube video instead. The only goal in this list I did not achieve was my jumping goal to touch the rim of a 10’ basketball hoop, although I’m just 1.5” short. This last 1.5” seems impossible though. I haven’t progressed for months, but I know this isn’t true. I’m only 5’8” so it may seem that way, and I nearly gave up entirely, but I reinstated that goal for this year (after announcing this defeat last month and getting bombarded with encouraging emails and support—thank you! ), and when it happens, you’ll definitely see it in a video. Now, in addition to being a student of Michael’s course, I’m also an affiliate, and I decided to push the promotion harder than I did the prior year because it had such an impact for me personally. With any large-scale affiliate promotion (the ones where you see a large number of influencers promoting the same thing at the same time, such as with this launch), it’s always best to come up with a plan to create a special bonus that’s just for those who purchase through your link, something that helps you add more value to the package, and also better serve your audience. This year, I decided to frame the promotion in a way where people could take the course with me. I created a bonus Facebook Group to house the students who specifically went through my link (the emails were provided to me after the launch was over), and I decided to live stream every evening for five days as I took the course so that others could have someone to take the course with them—and not just myself, but the rest of the community as well. In additional to that, I scheduled four accountability calls, one per quarter throughout the new year for these students too. That was enough to encourage over 200 students to sign up through my link, which not only provided affiliate revenue, but also created an amazing community of supportive, like-minded people who are all there to help each other. It was a great bonus, one that doesn’t require too much of my time because I’d be going through the course and recapping the lessons with myself anyway, and I’d personally want accountability calls like this too. So, if you ever have the opportunity to become a Joint Venture (JV) partner for a product that you can become a student of, you can create some unique bonuses that promote the community and accountability for the course work to help you drive more sales, and actually give a better experience for everyone taking the course, including yourself. This was a strategy that was very similar to what Tiffany Bymaster (a.k.a. CoachGlitter) shared in Session #281 of the SPI Podcast. Although the course you’re joining and promoting may have its own community, an even more niched one with people who are somewhat familiar with each other, if not personally, at least through a brand they follow, can be very beneficial and attractive for a prospect. Of course, if you plan on following this strategy, make sure you also know the quality of content within the course. It helped that I’ve taken this course the past two years in a row and know exactly the kind of impact it can make. I wouldn’t recommend doing this with a course that you’ve never experienced or know nothing about. Oh, and a big thank you to Michael Hyatt for once again setting me up for success in 2018! Also, make sure you check out his new book, Best Year Ever (affiliate link), which recently became a USA Today bestseller and cracked Amazon’s Top 20 for ALL books on Amazon! Congratulations, Michael! 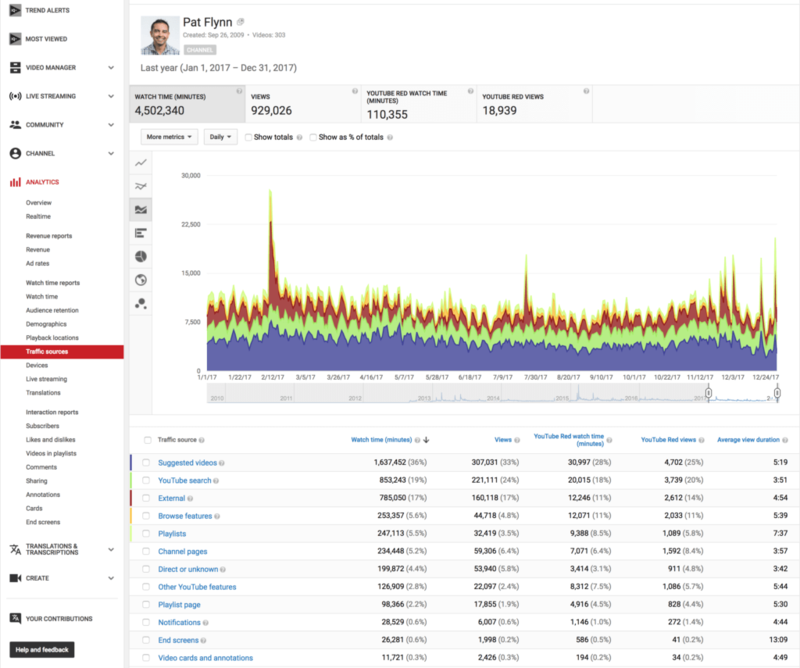 As you’ve probably heard me say over the past few months, YouTube has become a recent focus of mine. More than a potential platform to find new people, subscribers, and customers, I’m honestly having so much fun producing these videos. I’ve filmed and rolled out a few new videos—about one per week since I started to learn more about the platform—using those videos to experiment with different strategies, from thumbnail design to methods to increased watch time (the most important metric in YouTube-land). When February rolls around, you’ll start to see anywhere between three and five videos per week on the channel, so make sure to click here to subscribe if you haven’t already. You Tube Tip: From what I’ve learned (and can also confirm on my channel from years of videos that have just been sitting there since I started in 2009), search doesn’t account for most views for videos. It’s actually the suggested video recommendations that YouTube’s algorithm serves up on the sidebar of the video that you’re watching. That’s 36 percent of watch time, and 33 percent of all views coming from suggested videos. I learned a lot from many YouTubers in conversation about this, and also Brian Dean’s (Backlinko) course, First Page Videos, which is great and takes a very analytical and SEO-based approach to YouTube, which is obviously Brian’s forte if you know of him. And this, my friends, is why the thumbnail is one of your most important decisions when creating YouTube videos. When attending VidSummit in mid-2017, I sat through an entire 1.5 hour presentation that was literally all about producing optimized thumbnails. In other words, how to create thumbnails that get seen, and then clicked. Caleb, my videographer, also calls them “thumbstoppers” (meaning, when a person is scrolling on their phone with their thumb). Of course, you can create an eye-catching “thumbstopper” using lots of different techniques, including adding things that don’t necessarily relate to what the video is about; however, you risk having someone click-through, only to leave a few seconds later when the disconnect is apparent. And when you do that, you’re essentially telling YouTube that this video does not match the title and keyword that you produced, so you’ll rank lower and get fewer views as a result. Derral Eves, founder of VidSummit, told it to me best: You should try to make your thumbnails look like they are telling a story related to what that content is about. You also want the viewer to want to know more. Then he told me to hold a book that was lying nearby, hold it up, point to it, and he snapped a photo with his iPhone. He showed me the picture and then he said this is your thumbnail, except the book is blacked out, and there’s a question mark on it. Anyway, I have a lot more to learn, for sure, but I’m excited to continue to experiment, collaborate and see what I can do this year on the platform. Our goal is 250k subscribers by December 31, which is a lofty goal considering that currently as I write this post I’m around 88,000 subscribers. We’ll see what happens though! As much as I’m having fun with YouTube, it’s not all just for fun. It’s a small part in a larger strategy to generate traffic and get eyeballs on my online courses. Over the past year, with the launch of my courses, they’ve each been open and closed launches. They open for a short period of time, it creates a sense of urgency to get in before the doors close, and then you can only sign up for the waitlist at that point. Over $1m in earnings were generated last year from these open/close launches, but they are definitely time consuming, and I believe we can generate more by not letting those who are interested in the courses wait until the next opening, but also get smarter about the experience leads have through a proper and valuable sales funnel. There was no sales funnel before. All sales were generated via email and a few Facebook Ads here and there. That’s going to change as my team and I, along with the help of Molly Pittman who I hired, are working together to create several specific funnels for each of my individual courses. This will allow for the selling process to happen automatically so that I can focus more on driving traffic into these funnels, getting more strategic with long-term ads and targeting, and also open up more time to help serve my customers and my audience in general. You’d think I have all this in place already, when in reality this is all fairly new to me. Remember, it was only within the last year that I finally had my own products to sell. It was all about affiliate marketing before. But, we’re approaching this in stages. First, it was validation of those courses. Then, it was open and closed public launches. And now, it’s about optimization and automation here in early 2018. In terms of funnels, we actually previously attempted to create one as an experiment that utilized a tool called Deadline Funnel, which is a very powerful tool that allows you to create launch sequences for each individual on your email list at a specific time relative to when they signed up to your list. It allows for the automatic opening and closing of your courses for each individual. A part of it felt just disingenuous. Yes, normally launches are open and closed, but to create one that was just for the individual, as some of my team members put it, “didn’t seem very Pat Flynn like”, and I have to agree. This is no knock on Deadline Funnel, by the way. It’s a great tool, and we’ve never experienced such a great customer service team before, but the way we decided to use it just didn’t jive with what the brand stood for. Just being honest here, and sometimes you don’t know these things until you implement and actually see it in place. Part of the strategy was putting people into a waitlist first, which Molly basically ripped us apart on once we started working with her. She said, “Why are you holding back the customers who actually want to buy from you right now—that’s absurd!” And she was right. In several cases I can see a waitlist approach (with Deadline Funnel)/scarcity strategy working for something like a high-level coaching program or something that requires more of a person’s time, but not for something like an online course that a person could get access to right now and benefit from. Using a scarcity strategy for a bonus, or a discount makes more sense, but not the entire thing—at least for the products that I have. Lesson learned. However, we did get a number of sales using the experiment and have seen many of those students thrive, but everything is getting reconfigured as we speak, and just more honest in the approach. More on funnels later, but a big shout out and thank you to Molly Pittman for her help in piecing everything together. In working with her, it was nice to know we have a lot of the pieces, such as lead magnets, email segmentations, etc. already. The puzzle just wasn’t put together properly, hehe. She’s been a great help to put the pieces together! If you want to learn more about Molly and what she does, check out DigitalStrategyBootCamps.com. Other than those items, like I said before, December was pretty low-key. It was nice to spend time with the family, play board games every day, visit Disneyland and play some virtual reality and Rocket League too. I knew 2018 was going to be a busy year, but it’s always great to just sit back sometimes, forget about all the things that are coming, and just enjoy the moment with those you love most. Alrighty, let’s get to the income report for last month! 2017 was an amazing year, and I’m incredibly grateful for all of the opportunities that came my way. 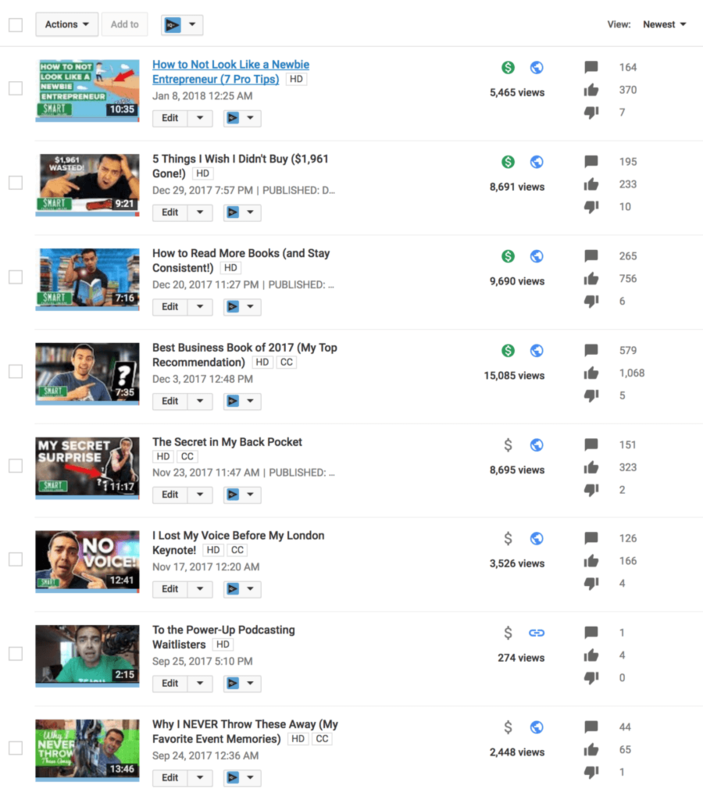 Now that we’re in 2018, I can see that it’s setup to be an even better year, from what’s coming in the product line, the fun I’m going to have on YouTube, and the speaking gigs I continue to land that keep getting bigger and bigger (come see me give the keynote speech at both Social Media Marketing World and Podcast Movement this year! ), and even a secret side-project that my videographer Caleb and I are moving forward with. During the downtime I had to reflect on the year, I also looked back at some of the things I could improve. One of those things was procrastination. Although I get a lot of things done, many of those things are done last minute. This always adds a layer of pressure that I don’t think needs to be there, although I sometimes try to tell myself that I work well under pressure, so I might as well wait until we’re close to the deadline anyway. I don’t always procrastinate, but when I do, I’m a little unsure about how to feel about it. It made me realize that procrastination doesn’t just involve me and my projects, but a lot of other people too—from my team, to my family, and my audience too. I’m going to work harder to procrastinate less, which may mean creating “false” deadlines because I do feel that the pressure helps me focus. In addition to that, one thing I am working on, and creating a habit for, is making sure I express my appreciation to April, my wife, each and every day. She is amazing and has never blinked an eye at any decisions I’ve made in my business and in our lives, or anytime I’ve told her I need to stay busy for the next few days for a launch or go on business travel. I do make sure to try and balance everything out (e.g., after a launch or something that requires a lot of my time, which means extra work for her as an already busy stay-at-home mom), but in learning about what she likes best, it’s simply recognition and appreciation. So, I’m making a habit every single day to in some way, shape, or form, purposefully express my gratitude to her for all that she’s done, and continues to do to serve this family. Although she’s not actively involved in my business, she is a huge contributor to it, as a supporter, as a mother to our beautiful children, and as a teammate in life. This record year wouldn’t have happened without her, and although she likely won’t ever read this blog post, perhaps it’ll convince someone out there, if they see me out in public with my family, to not only thank me for any service I’ve done to help them, but also thank my wife too. She deserves it way more than I do. Here’s to you and those who support you in your journey, and an amazingly successful, fun, and memorable 2018. Here we go!